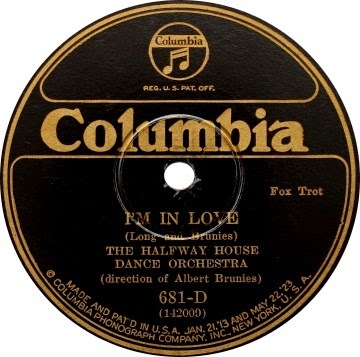 This happened to be the latest issued (1926) record in a batch of 78s that was discovered untouched (and apparently unsold) for decades in an old abandoned store in the midwest several years ago. I had been after this one since seeing it a few months ago and after a little horse trading, was finally able to bring it home yesterday. 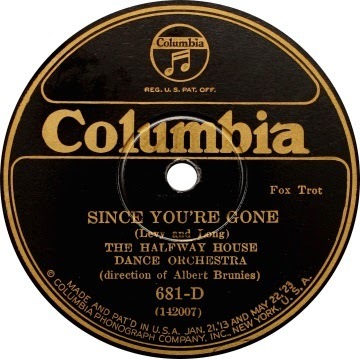 The Halfway House Orchestra's complete output can be found and purchased here on Jazz Oracle's first release. Albert Brunies c / Charlie Cordella cl / Glynn Lea 'Red' Long p / Angelo Palmisano bj / Chink Martin bb / Emmett Rogers d.